Tue., June 25, 2013, 1:59 p.m.
BOISE – Grover Norquist is best known as an anti-tax activist – he wrote the no-tax-hikes pledge that’s now been signed by nearly every Republican member of Congress – but he’s also a big backer of reforming the nation’s immigration laws, a cause he’s been pushing for the past 30 years. 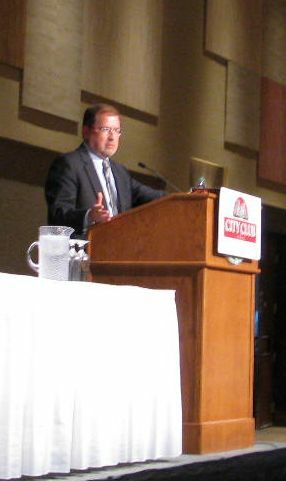 Norquist came to Boise on Tuesday to tell Idahoans why he thinks conservatives should support immigration reform, and drew a crowd of more than 250 to the talk sponsored by the City Club of Boise. The Harvard MBA and president of Americans for Tax Reform spoke in support of the bipartisan bill now being debated in the U.S. Senate – which thus far, both Idaho Sens. Mike Crapo and Jim Risch have opposed – and lauded Idaho Rep. Raul Labrador for being “front and center” in the debate in the House. Norquist said he came to Idaho because “you had a business community that was interested … and also to be supportive of Labrador’s efforts,” and to encourage Idaho’s two senators to get on board. The United States gains 4 million people a year who “don’t speak English, don’t want to work for a living, have to be taken care of – they’re called babies,” he said to laughter. “They have this incredible sense of entitlement.” New babies born to Americans each year also will put a future strain on Medicare, he said, but people don’t argue that’s a reason not to procreate. Norquist said he’s been to Idaho many times over the years; the first was in 1978 when he was about 21 years old, to help craft the state’s property tax-limiting One Percent Initiative, shortly after California had passed its controversial Proposition 13. “We basically whited out ‘California’ and typed in ‘Idaho,’” he said with a chuckle. The initiative, which sought to limit property taxes to 1 percent of value, passed, but proved incompatible with Idaho’s tax system. State lawmakers followed up by instead imposing a 3 percent cap on annual increases in local government property tax budgets that still largely stands today. Published: June 25, 2013, 1:59 p.m.